In a medium size skillet cook the onions, peppers and oil in a pan over medium heat until the onions are translucent and soft. While those are cooking take your store bought chicken and de-bone and chop into bite size pieces and set aside. Place your rice in the microwave and heat according to package directions. If you are using cook and serve rice you should start that now too. Either kind works well in this dish and honestly sometimes cheating and using minuet rice just makes life a bit easier. Spray a 9X13 baking dish with a bit of non-stick spray. Place a bit of the pre-made enchilada sauce in the bottom of the pan, spreading evenly. Next take about 6 of the corn tortillas and layer them on top of the sauce these will be our “lasagna noodles”. 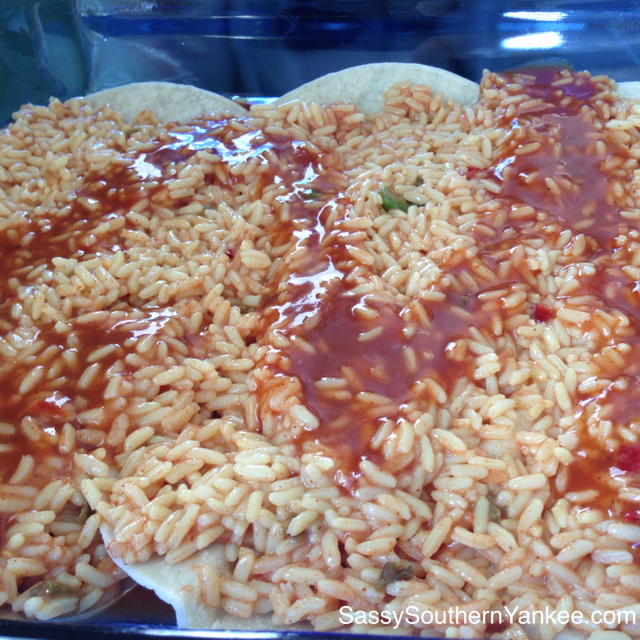 Next layer on the rice and spoon a bit more of the enchilada sauce over the rice. Place another layer of the corn tortillas. Add the chopped chicken evenly over the tortillas. Add the eater and seasoning to the onions and peppers. 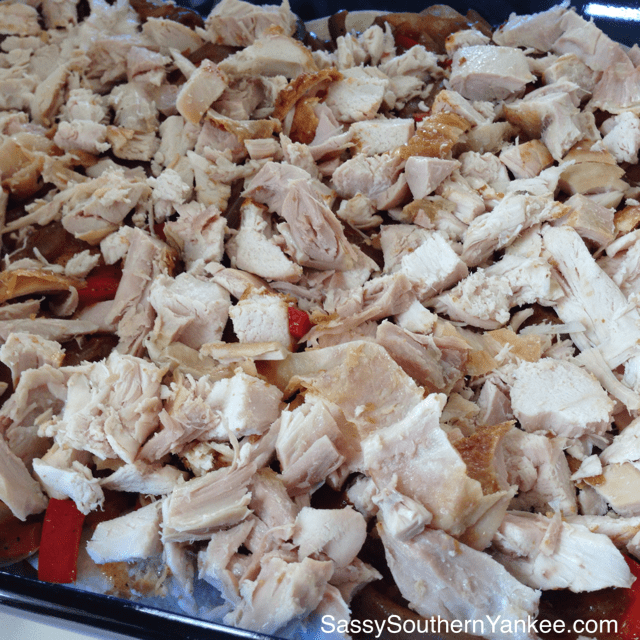 Cook until the sauce starts to thicken then remove from the heat and spread evenly over the chicken in the casserole dish. 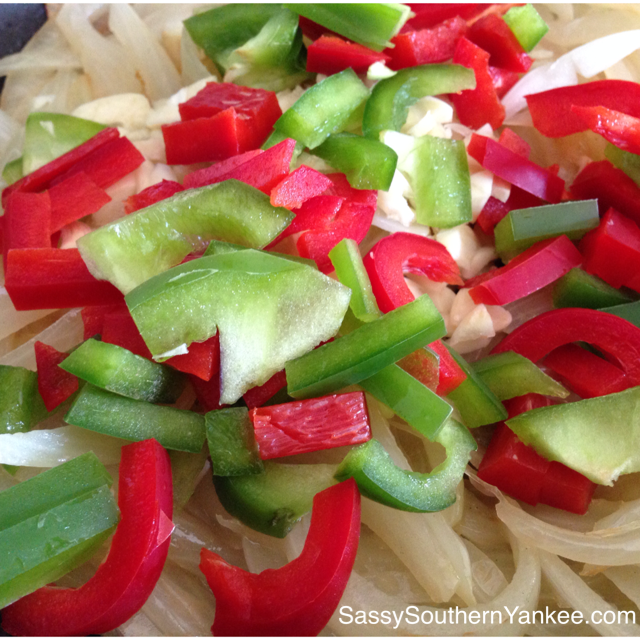 Place a bit more of the enchilada sauce over the onions and peppers. Add the final layer of the corn tortillas. 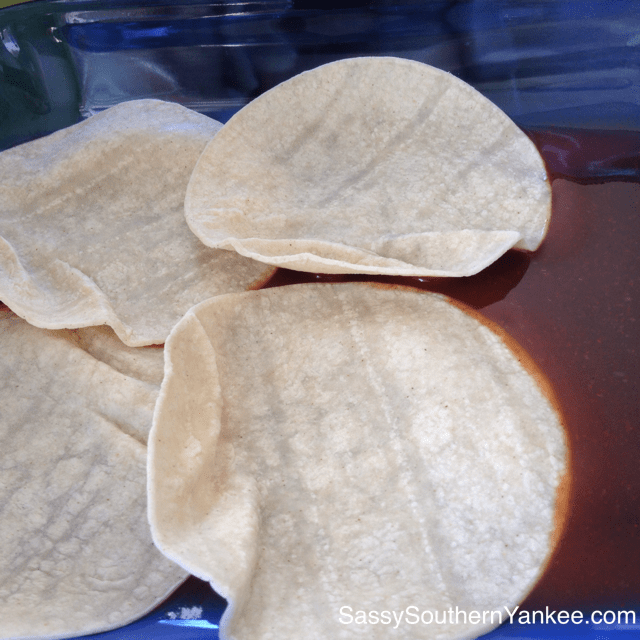 Use the remaining enchilada sauce and cover the top layer so that every bit of the dish is covered. Sprinkle the cheese over the top of the dish. Bake in the oven for 30-45 min until bubbly and the cheese is melted. Serve with a bit of sour cream, salsa and guacamole a margarita won’t hurt either 😉 Happy Cinco De Mayo!! Spray a 9X13 baking dish with a bit of non-stick spray. Place a bit of the pre-made enchilada sauce in the bottom of the pan, spreading evenly. Next take about 6 of the corn tortillas and layer them on top of the sauce these will be our "lasagna noodles". 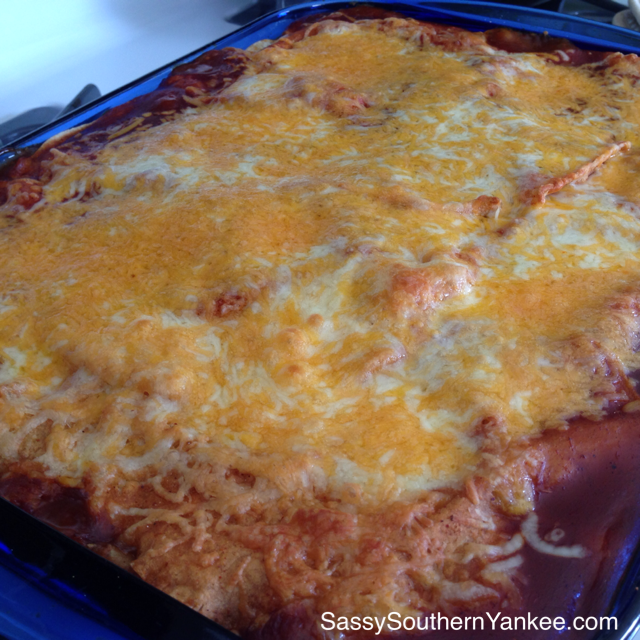 Use the remaining enchilada sauce and cover the top layer so that every bit of the dish is covered. Sprinkle the cheese over the top of the dish. Bake in the oven for 30-45 min until bubbly and the cheese is melted. Serve with a bit of sour cream, salsa and guacamole a margarita won't hurt either 😉 Happy Cinco De Mayo!! 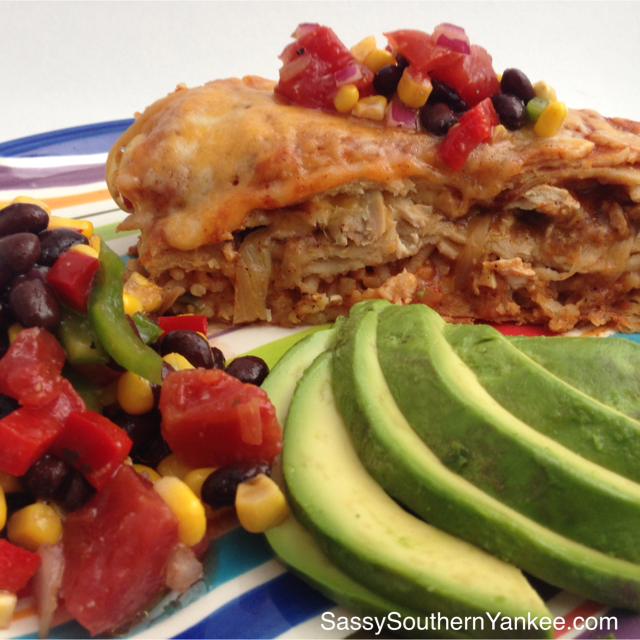 This entry was posted in Main Course and tagged Casserole, Chicken, Chicken Fajita Enchilada Casserole, Cinco De Mayo Recipes, Corn Tortillas, Enchilada, Fajita, Garlic, Gluten Free, Green Peppers, Guac, guacamole, Mexican Recipes, Onions, Peppers, Red Peppers, rice, sour cream.